11.02.2013 – the next best thing to making history must surely be recording it. The record is also one of the finest in a continuing series of homages to the Manouche sound that was glorified by Mr. Reinhardt and his alter ego, the violinist Stephane Grappelli. It is, as the cover reveals, a re-mastered edition of two early recordings produced by one of the most dedicated ethnomusicologists and guitarists in Europe—perhaps in the world—the admirable, Dave Kelbie. In fact, Swing Guitars CD 1 in this package was the first release on the Lejazzetal imprint, which has grown into one of the most important and certainly one of the most exciting labels in Europe. And it is thanks almost entirely to Mr. Kelbie and his indefatigable energy, which he uses to preserve the endangered art of Manouche swing music from all over Europe, including the sublime work of the Belgian, Tcha Limberger and the heir to Mr. Reinhardt’s style of unamplified guitar, Mr. Lafertin. Mr. Kelbie has also done something else remarkable and that is to meticulously recreate in recordings the preservation of authentic and utterly “live sound”. Working with extraordinary acoustic engineer Lance Andrews—who was responsible for these original recordings—Mr. Kelbie created that remarkable sound in a barn. For this re-issue, Mr. Kelbie took the original tapes and, with the infinitely talented Dylan Fowler, re-mastered them at the legendary Stiwdio Felin Fach in Abergavnney, Wales. But this is about Fapy Lafertin and the historic recordings that as majestic for their music as they are for their sound. His virtuosity is untrammelled and it appears to matter not that he is human, capable of any frailty whatsoever. When he plays Nature seems to stop and listen. His lines are sensuous and this comes from the fact that his left hand caresses the neck of his guitar; the fingers of that hand glide along frets and neck in mighty glissandos that produce notes and chords, while the fingers of his right hand make love to the strings one glorious note after the other. His soli have soaring melodic sojourns and leap off the plane from whence the music originates into a vortex that returns the spectacular energy of his playing with musical colours and textures that make Nature blush as if it were her that Mr. Lafertin was making love to. Notes flow in wide and swishing arcs, belying the linear source of the melody. Sometimes Mr. Lafertin might begin a line from somewhere in the middle of the original melody, creating a new musical tributary of the river of sound that produced the original song; at other times he might turn the melody on its head and literally play it almost back to front. His interpretations of songs are always exciting, meticulously executed and full of surprises. 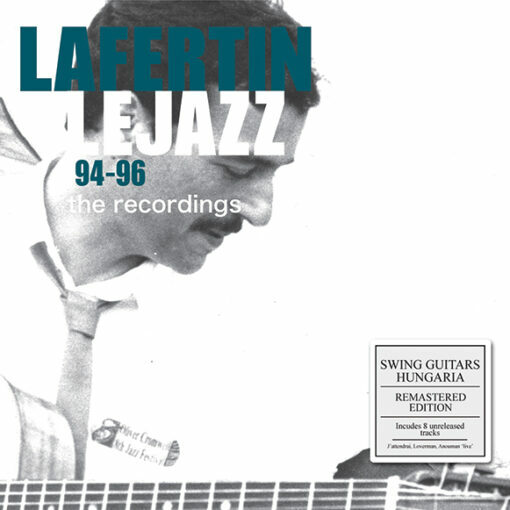 Fapy Lafertin’s voice is elementally different from Django Reinhardt’s. Mr. Reinhardt’s voice inhabits the somewhat darker colours of the musical spectrum, often turning dense as he was driven by the contrapuntal relationship with Mr. Grappelli. The violinist admitted to being absolutely mesmerised by the guitarist’s music that seemed to be suggestive of sometimes rippling from the darker side of the moon. Mr. Lafertin, on the other hand, is continually bright; full of all that is joyous in Nature. This directly impacts his unforgettable impressions of classic charts and Reinhardt tunes, as well as his own compositions—of which sadly only one, “Notes Noir,” is heard on CD 2. However, his interpretations and re-visioning of standards—“My melancholy baby”—is given to inhabiting songs more like a beguiling magician putting on a second skin from his head to the heart and soul of his body, to his fingertips, than a guitarist who is fashioning music from a shapely box that makes exquisite sounds. Thus the last-mentioned song is more a bittersweet rendition that rises above sentimentality and soars with acceptance and joy. Mr. Lafertin dapples his music with moist watercolours that dribble and ripple with gloriously vivid energy. 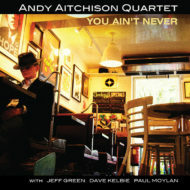 His tonal detailing is remarkable and swerves, and swings in a manner that suggests a musician who is eternally optimistic. 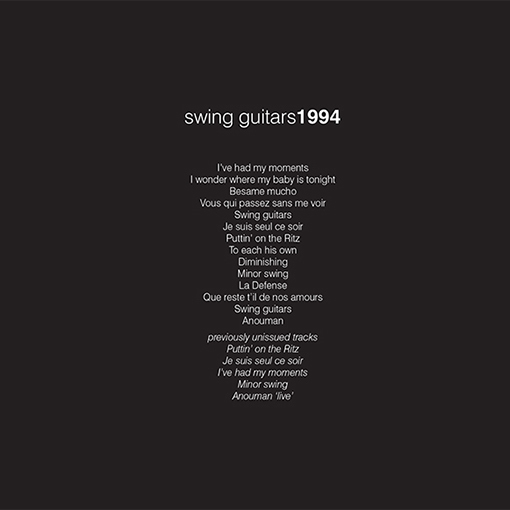 Thus the record, Swing guitars 1994 bubbles and races to and fro like a young and carefree brook. Hungaria is slightly more pensive, and this is probably more so when the great clarinettist, Bob Wilber, appears on “Songe D’Automne” spreading his burnished woody sound and a propensity to wail with the greatest on “Swing 42” and, most especially, on “Stockholm”. 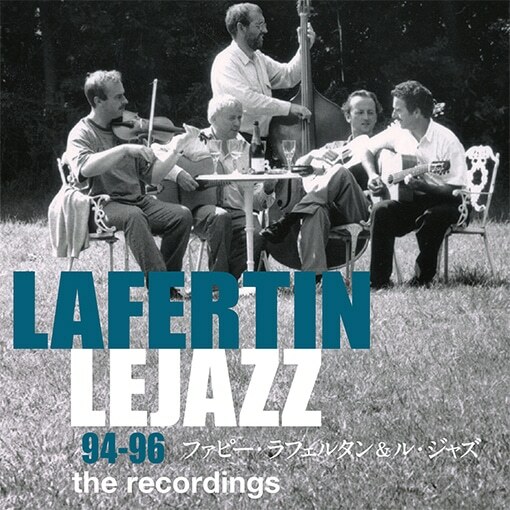 While Mr. Wilber is the surprise guest who adds a diaphanous cloak of warmth to the 1996 set, it is the Le Jazz quartet that hosts the majesty of Mr. Lafertin with cheeky aplomb. The virtuoso violin work of Steve Elsworth is exquisite, and recasts the relationship that Mr. Grappelli had with Django Reinhardt, but with a sanguine twist. Mr. Elsworth raises his game by firing great missives toward Mr. Lafertin, who responds in kind. A great example is “I wonder where my baby is tonight” from CD 1 as well as “Time on my hands” from CD 2. Guitarist Pete Finch plays with bite and his joie de vivre is infectious. Bassist Tony Bevir is a spectacular time-keeper and also displays a sublime talent for melodic invention every time he is called upon to solo. And, of course the magnificent guitarist, Dave Kelbie is a harmonic cannon, exploding with colour and the kind of density of texture that seems to be the glue that holds it all together. Mr. Kelbie is probably one of the greatest rhythm guitarist in all of music—especially in the Manouche style. 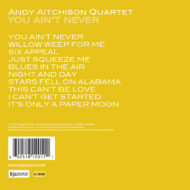 He is unique in responding to the musical conversations with his lead players with forthright harmonies that glow and dapple in the sunlight, while imparting to the music, the rhythmic rumbling of a folksy freight train. No man of Scottish, English, Danish origin fits better into the Manouche mode than Mr. Kelbie. This is simply because he is made entirely of music: head to toe, body and soul. It was this remarkable record, Swing guitars 1994 that created this most enduring relationship with the Le Jazz quartet, a relationship that lasted a decade. Before that Fapy Lafertin played with the famed Waso, the Belgian band that contained that other musical genius, the great rhythm guitarist, Vivi Limberger. 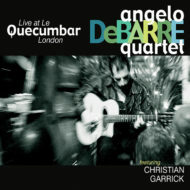 However, it is here that Mr. Lafertin is heard in all his glory beginnings; in the magisterium of the Le Jazz Quartet. Just as spectacular is the fact that this recording has been made the old fashion way, using a ribbon microphone made for the BBC in about 1938, recorded by a master and mastered by a musician who also happens to have one of the best pairs of ears in music. This powerful combination of music and engineering makes 94 – 96 the recordings one of the most historic and memorable packages brought to a discerning public in Europe and hopefully to America as well. Avec la réedition de ces albums, on a l'occasion de réentendre facilement deux disques considérés comme majeurs dans la production discographique de ce que l'on appelle maintenant le Jazz Mânouche. 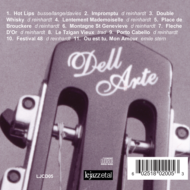 C'est grâce à Dave Kelbie, excellent guitariste anglais qui dirige ce label Jazzetal Records, qui nous apporte cette réedition superbe de deux albums mythiques et devenus presque impossibles à trouver. "Hungaria" et "Swing Guitars". Fapy Lafertin est un guitariste au touché reconnaissable entres tous, amoureux du son du Django du Hot Club de France. D'ailleurs, en 94-96, ces deux disques avaient été enregistrés avec un micro de 1938 que Fapy avait récupéré aupres de spécialistes, étant lui même passionné par le son vintage, ils recherchérent à reproduire le plus fidélement possible le son de l'époque. Bien sûr, pour la présentation de cette réedition, ces deux disques remastérisés sont inclus dans un coffret agrémentés d'un livret garni d'une vingtaine de photos noir et blanc ainsi qu'un bonus de 8 pistes. Fapy Lafertin est indéniablement le spécialiste du Django des années 38/40. Pour lui, cette musique est une histoire familliale qui l'accompagne depuis l'enfance, comme tous les musiciens mânouches. Né en Belgique, en 50, c'est avec son pére, ses oncles (dont le celèbre Bamboula Ferret), ses fréres et cousins qu'il découvre l'univers musical de Django dés ses 5/6 ans. Il se fera rapidement connaitre avec Koen de Cauter dans les années 70 (Koen dont nous avions chroniqué le joli album en hommage à Brassens) au sein d'un groupe qu'ils avaient appelé Waso qui transportait la musique que jouait Django avec la clarinette d'Hubert Rostaing. Comme on l'a rappelé, Fapy étant amoureux du Beau Vieux Son, a eu à coeur de chercher à récupérer ces fameuses guitares Selmer que jouait Django, il en a eu quelques unes à l'époque ou elles étaient encore trouvables. Mais, il s'est également interressé à divers styles musicaux, comme le Fado avec la guitare portugaise, et surtout la musique classique qu'il aborda sans savoir lire la musique, l'obligeant ainsi à apprendre par coeur certaines pièces. Jusqu'à ce qu'il se décide à apprendre à lire cette musique afin de gagner du temps! L'amenant ainsi à une période de sa vie où le classique l'accaparait complétement. Actuellement, Fapy travaille beaucoup avec Lolo Meier, un cousin avec lequel il réalise quelques beaux projets , ainsi que de trop rares passages en France hélas, ainsi qu'en témoigne leur passage lors du festival de Samois 2010. Egalement, il coopére toujours avec son vieux compére Koen de Cauter, ainsi qu'avec les fils De Cauter qui sont de remarquables musiciens, sur des réalisations discographiques particulièrement interressantes. Fapy Lafertin à la guitare, Steve Elsworth au violon, Dave Kelbie et Pete Finch aux guitares rythmtiques, Tony Finch à la contrebasse. et Bob Wilbert sur certains titres de l'album Hungaria. Ce double album est une vraie pièce de collection, et gageons que ce label arrive à renouveler cette expèrience de reédition sur d'autres trésors oubliés! Réédition bienvenue de ces deux disques parus il y a une bonne quinzaine d’années sur Le jazzetal, petit label créé par Dave Kelbie , qui sort de grands disques (Angelo, Django à la créole, Tcha Limberger…). L’histoire remonte à 1986-87 ; pour fêter les 50 ans du jazz club d’Eastleigh près de Southampton, le Jazz, quartet récemment formé s’exprimant dans le style Hot Club (Steve Elworth, violon, Dave Kelbie et Pete Finch, guitares et Tony Bevir, contrebasse), a l’idée d’inviter Fapy Lafertin, déjà connu en Angleterre pour y avoir joué à maintes reprises avec Waso. S’en suivront 10 ans de compagnonnage, des centaines de concerts un peu partout et l’enregistrement de ces deux disques considérés comme le top du top dans le pur style Django. De plus les deux disques ont été enregistrés à l’ancienne, en mono, avec un seul micro de la fin des années 30, histoire de s’approcher du son du quintette du hot club de France ; deux disques remastérisés, réédités en un seul coffret avec 8 bonus tracks et un livret d’une vingtaine de pages illustré de belles photos en noir et blanc. Django est célébré par d’excellentes versions de Swing guitars, Diminishing, Anouman sur le CD1 sorti en 94, 12th year, Hungaria, Billets doux, Black and white sur le CD2 avec Bob Wilber invité à la clarinette sur quelques titres, et également par des standards joués par le maître comme Songe d’automne, I Wonder where is my baby tonight, Liebestraum, Times on my hands ou Viper’s dream, auxquels Fapy imprime sa patte et sa classe. Fapy fait preuve d’une retenue, d’une sensibilité mélodique et d’une clarté d’articulation qui le distinguent absolument de la pléthore des héritiers de l’illustre manouche (cf l’intro de Times on my hands ou l’accélération de Billets doux). Fapy est sans doute celui qui se rapproche le plus de Django sans jamais le copier. Styliste au phrasé immédiatement reconnaissable, il conjugue finesse, swing et élégance dans ses chorus d’une rare intelligence toujours remarquablement construits (cf I have had my moments ou le méconnu To each is own), poétisant finement sur les ballades (Je suis seul ce soir, Vous qui passez sans me voir …). Quand il ne chorusse pas, Fapy appuie la rythmique de son drive impressionnant conjuguant autorité et souplesse (cf swing guitars). Ses petits camarades sont au diapason et lui déroulent le tapis ; une rythmique exemplaire qui swingue, un violoniste très en verve sur tempo nerveux (cf Puttin’ on the Ritz) et tout en sensibilité sur les ballades. Indispensable bien sûr ! 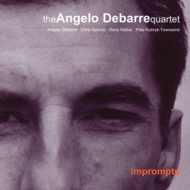 A welcome re-edition of two albums released by lejazzetal, the label created by Dave Kelbie which has brought out big albums with Angelo Debarre, Django à la Créole, Tcha Limberger…) The history of this album goes back to 1987. Le Jazz, a quartet steeped in the traditions of hot club music, (Steve Elsworth – violin, Dave Kelbie and Pete Finch – guitar and Tony Bevir – double bass) invites Fapy Lafertin to tour the UK, already known in the UK for having played many times with Waso. They will work together for ten years, hundreds of concerts almost everywhere, and the recording of these two albums, widely considered as the top of the top of the pure style of Django Reinhardt's music. All the more since they were recorded as in the 1930’s, in mono, with an old mic of those days in order to get as close as possible to the sound of the hot club de France. 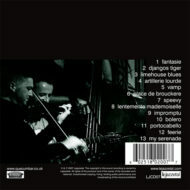 Django is celebrated with excellent versions of Swing guitars, Diminishing, Anouman on CD1 made in 1994. 12th year, Hungaria, Billets Doux, Black and white on CD2 with invited guest clarinetist Bob Wilber on some titles and some standards interpreted by Django such as Songe d’Autumn, I Wonder where is my baby tonight, Liebestraum, Time on my hands and Viper's dream all of which receive Fapy’s mark of class. Fapy proves to be holding back, of being very sensible melodically and of having a beautiful clear articulation which distinguishes him from most of the other players in the Manouche style, for example the intro of Time on my hands and the tempo change in Billets Doux. Fapy is the one who gets closest to Django without ever copying him. Stylish phrases immediately recognisable, he marries nobility, swing and elegance in his improvisations of rare intelligence…always remarkably well constructed (e.g. I've had my moments or the much ignored To each his own) and fine poetic playing on ballads such as Je suis seul ce soir and Vous qui passez sans me voir.